This handprint angel is from an arts and crafts handprint book mentioned in an earlier post. The book is called "Hand-Shaped Art." The angel is not as easy as the first angel, but still easy enough to do with children. First on a white piece of paper trace a child's open hand. 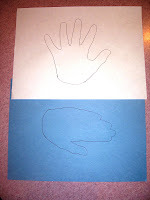 Then on another color piece of paper trace a child's closed hand with the thumb set apart a little. 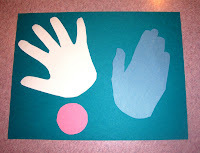 If the child is able, have them cut these out, you may have to do this for younger children. Now here is where it got tricky for me. (I don't know, maybe I was getting tired). Anyway, the closed hand gets glued to the palm of the open hand, with the thumb sticking out. I was having trouble making sure the lower palm of the open hand was covered. Now have the children cut a circle for a head out of another piece of construction paper, or have one available for them. Let them draw a face, add glitter for a halo, then glue the head to the thumb of the open hand. She's ready to go. Have fun. This is cute---I've never seen something like this before. 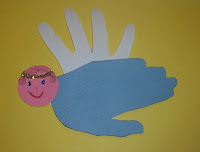 I just made this with my kids...I used my 9 Month olds hands for the wings and my 3 year olds hands as the body. It came out WONDERFUL!!! I even pasted a small picture of the kids on the body...I'm giving this as a gift from the kids to all of my family!!! !